February 16, 2017: House Bill 1432 that would repeal Virginia's switchblade ban including allowing concealed carry, for the most part, has passed and is now on the Governor's desk awaiting his action. If you live, work or travel in Virginia, please CALL or EMAIL Governor Terry McAuliffe and simply deliver the message that you are calling or emailing to respectfully request that he "please sign HB 1432." Please be POLITE and RESPECTFUL and REMAIN ON POINT. There is no need to say anything further, just "please sign HB 1432." If from out of state, briefly explain why you travel to or through Virginia. Click to Email via the Governors' form. 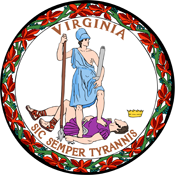 January 24, 2017: House Bill 1432 to repeal Virginia's Switchblade ban has passed out of the Courts of Justice Committee on a vote of 13-7. It now moves to the full House for a vote. Knife Rights is working with our friends in Virginia to assure that the final language of this bill best serves knife owners. January 14, 2017: House Bill 1432 to repeal Virginia's Switchblade ban has been introduced by Delegates Lee Ware (R-65) and Scott Lingamfelter (R-34). Knife Rights is working with our friends in Virginia to assure that the final language of this bill best serves knife owners.